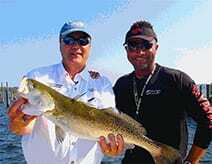 ICX is the Destin Inshore Fishing premiere, year-round professional light tackle Destin Inshore Bay Fishing Charter & Destin Nearshore Gulf Guided Fishing Charter. You have just taken the first step toward ensuring you and your family/friends have a fun and memorable fishing experience on the water. Come on down and spend an exciting day with seasoned Destin Charter Fishing Guide and highly accomplished Tournament Angler, Capt LW Burroughs and his Team of accomplished Family Friendly Guides, who fish the World Famous Emerald Coast of Destin, Florida. 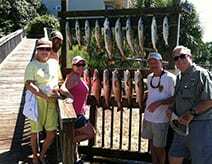 "Spectacular Speckled Trout & More"
When chartering a boat, the equipment is always secondary to the guide. Everyone has a boat and some rods. The question is whether they can find and catch fish! Capt. L. W. Burroughs is renowned for his knowledge of Destin’s inshore waters and the seasonal patterns of his fishery. His techniques for finding and targeting a specific species is exactly what I’m looking for in a professional fishing guide. L.W. caters to his customers with personal and “over-the-top” service. From the beginning saltwater angler, to the “old salts”, Capt. L. W. Burroughs makes fishing fun!Living on the Gulf Coast allows us to fish just about every month of the year and having a guide that can follow patterns of seasonal fish is mandatory for filming a fishing show.It only comes through experience, knowledge, hard work, early mornings, and lots of time on the water. If Capt. L.W. 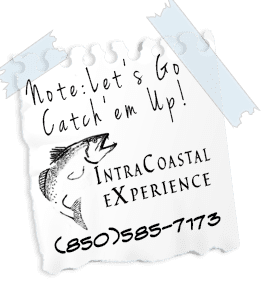 Burroughs says the fish are biting, drop what ever is in your hand and make the call and booking for Intra Coastal Experience fishing charters.Submitted by Gary Finch, Professional saltwater fisherman and host of "Gary Finch Outdoors" television show, on air since 1988. "Amazing time with a talented guide, it makes a difference!" I've fished all over the world and it makes a real difference to have a guide that is all about making it a great experience for his clients. Capt. LW was funny, knowledgeable and really explained how to catch the fish and why they were in that location. We all learned something. It was fun, exciting and truly a memorable experience. Please, if you are thinking about using a guide service, chose this one. I promise it will be the best decision you make during your vacation. "Best Fishing (and catching) in Destin!!" LW was a quite possibly the best fishing guide we have ever used! This retired Air Force man grew up in the Destin area, and knows these waters like the back of his hand. He had us on the fish within 3 minutes of anchoring, and when they weren't biting, we never stayed more than 5 minutes in that spot. My father, an avid salt water fisherman, caught his "trout of a lifetime" a 27 inch 7 pounder! At the last stop of the morning, LW got us on a honey hole of redfish. What a blast! We literally had to tear ourselves away at the end. Between the 4 of us, we came away with 10 trout and 6 beautiful redfish, which LW then proceeded to clean for us. He also told us of a place that would cook them for us too! I would highly recommend LW and his Intracoastal Experience to anyone who loves to not just fish, but CATCH! What a great day, and a personable, knowledgeable guide! Thanks, LW! You rock!